Modified Arts alumni and veteran Phoenix artists, combine forces for their first joint exhibition, despite decades of working alongside one another. 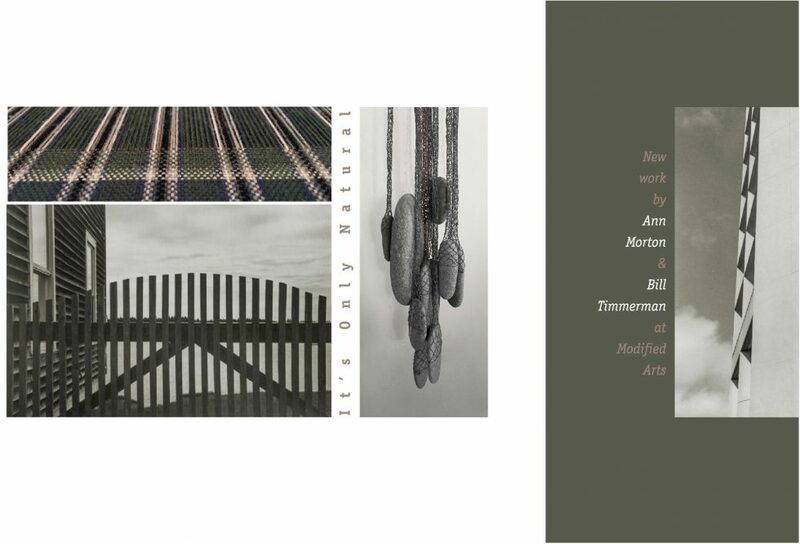 This exhibition features new, never-seen work by mixed-media fiber artist Ann Morton with photograper, Bill Timmerman. The show visually relates specific findings from their summer travels of 2017. Bill looks for ties between the built and unbuilt world, while Ann employs the serendipity of found objects and random experiences – brought together to convey new messages. Together, this collection opens up larger questions about what comprises the “natural” world. Ann Morton emerged from a 35-year career in graphic and environmental design to receive her MFA from Arizona State University in 2012. In the years since, Morton has quickly notched exhibitions in Rio de Janeiro, Grand Rapids, Phoenix, Tucson, Los Angeles, Detroit, Houston, Jerusalem, and numerous other cities nationally and internationally. Her “Ground Cover” project was selected by the Americans for the Arts, Public Arts in Review for 2014 and received the 2014 Arizona Forward Crescordia award for art in public spaces, and selected Best of Show in the 2015 Surface Design Association international show. The “Collective Cover” project was selected in the top 5 Juror’s picks for the 3D category in the 2012 ArtPrize – Grand Rapids, Michigan. Most recently, Morton completed “Re:Thanks,” a major “quilt” sculpture shown across Arizona, produced from materials gathered at her residency at the Materials Recovery Facility in Phoenix. Bill Timmerman, an Arizona resident since the 1980s, has built a career on seeing the lines between nature and the built environment. Working as an architectural photographer by day, his keen eye as identified the lines and natural reflections in buildings by such renowned architects as Will Bruder. This translates into his personal photography a softness, observing how the shapes of the world around us mark and affect our routines, moods, actions. Using intimate black-and-white, silver processed photos, the artist makes every object of architecture into a new horizon line. Timmerman has exhibited across Arizona, and is in the collection of the Museum of Fine Arts, Houston. Or by appointment, scheduled by E-mail.